Build the city of your dream in real looking world. Be the mayor of the new city on a island, build new houses, grow business and expand your virtual city with community buildings and decors. 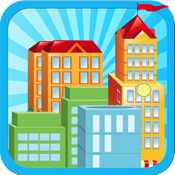 Choose from hundreds of buildings and decors, customize your city on iPhone, iPad and iPod touch. Build residence building to increase city population and community buildings to increase population limit. Build houses from fisherman house, lake house to mansion, beach condos, apartment complex. Run business on your city with burger shop, bakery store, restaurants, sports, jewellery and markets. Build spa, cosmetics, ladies wear and other shops for your fashionable ladies. Business can't run without goods; Harvest crops on farm plots to increase goods. Enjoy farming crops and fruits besides building your town. Grow Strawberry, Turnip, Pea, Carrot, Pumpkin, Pineapple and others and harvest crops. Decorate your city with trees, parks, sports and stadium. Watch your town grow up with WONDERS and SCULPTURES. Build School, College, Police Station, Museum, Hospital, Bank, Opera and much more on your city. Hundred quests to get more bucks. Houses and buildings are from old fashion to modern style. You can decorate as modern city or ancient village. Expand your town and unlock more buildings while you level up. Make your dream and imagination come true to build and manage a city. Make your own story to be a successful mayor. Play regularly to get rewards, complete quests and grow your virtual city day by day.